The weekend was cause for celebrating as the first babies were retrieved safely from their parents. 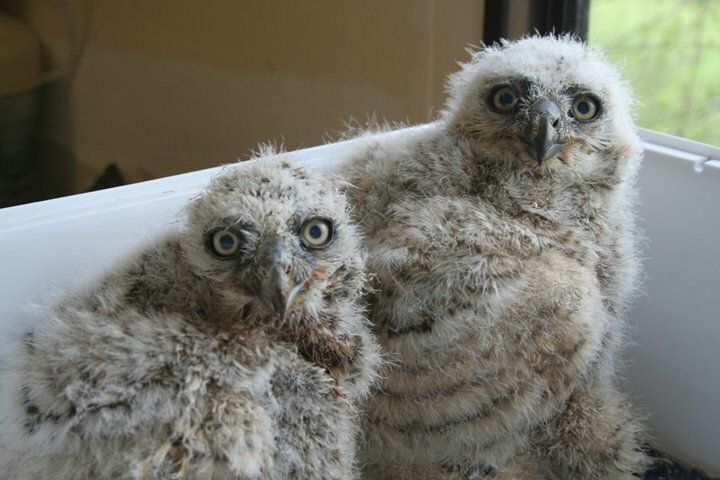 Mum and Dad hatched 2 perfectly healthy Great Horned Owlets, despite the cold weather and snowy conditions endured by the centre this year. It was touch and go as the adverse weather conditions seemed to throw confusion to the breeding season, causing them to nest much earlier this year. We heard the mating calls as early as January, which meant we had to work hard and fast to get the materials and nest boxes ready for the newcomers but the hard work seems to have paid off with the arrival of our first babies hatched at the end of March. There has been a lot of work taking place in the park for the past year in order to improve the environment for the birds and public, and we would like to thank you for your patience; putting up with what could only be described at times to be a bit of a building site! But we seem to be getting there and reaping the rewards in the form of, obviously very content birds. However we still have a long way to go! With the hatching of our babies we are offering you the chance to adopt a bird and be in with a chance of naming the owlets. We are in the process of reviewing the adoption scheme however if you want to contact us we will be able to help and answer any questions. As we are expecting more babies this year and with over 100 birds already in the centre we unfortunately can’t make a promise to keep everyone of them but an alternative will be offered if your bird is re-homed. In the case of more than one person adopting and wanting to name a baby, your chosen name will be entered into a draw and the first name picked from the hat will become the baby’s name. Keep an eye on our website for more updates and photos of our babies and choice of adoption schemes.